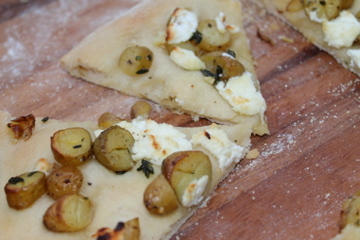 Last Friday I quickly made a pizza dough and while I waited for it to rise, I looked for something to put on it...not wanting to leave the house...I found that we had a bag of small fingerling potatoes, a shallot, fresh thyme and goat cheese. So I made a salad and this was dinner... it was delicious. I washed the potatoes and put them in a sauce pan with ice water (since having the convenience of instant hot water, we have realized that it's not always perfect. I have started adding ice cubes to the tap water before bringing them to a boil because if the water is too hot when you start, the potatoes do not cook evenly). Boil for about 10 minutes, they should be tender, but still hold their shape and skin. 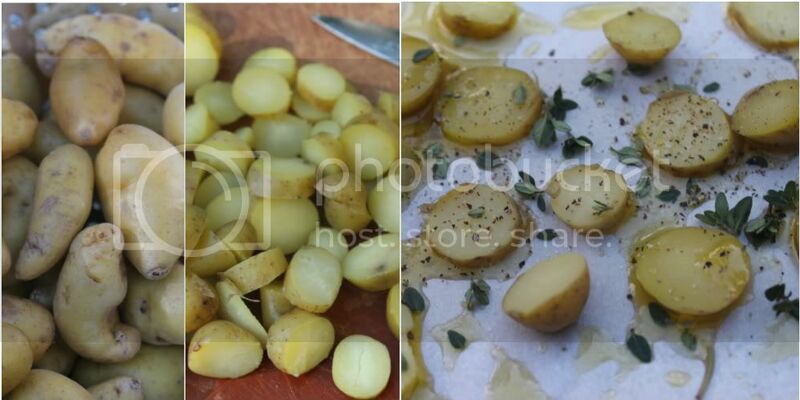 Slice each potato into small circles. Toss with olive oil, sea salt and freshly ground black pepper and fresh thyme. Bake in a 375 degree oven on parchment paper for about 8 to 10 minutes. Prepare the pizza dough, drizzle a little olive oil and add potatoes and goat cheese and bake until the crust looks lightly browned. You can add a few caramelized shallots as you are about to serve. On Sunday I needed an appetizer that would travel well. I loved the taste of the pizza, but knew that would not work. I made tiny little puff pastry tarts using the same idea from the pizza on Friday. For the appetizer, I used two sheets of puff pastry that I let defrost in the refrigerator overnight. I rolled them a little thinner and then used two round cutters. The larger one is about 2 1/4" and I used it to cut them out. I used the smallest one (about 1 1/4") to score the inside of the larger one. 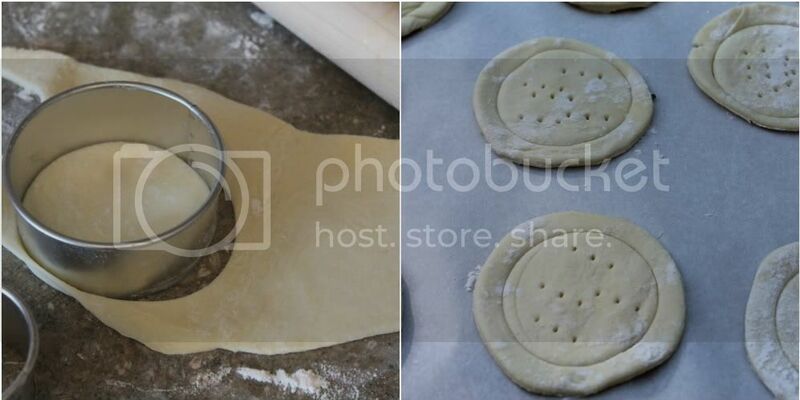 I used the tines of a fork to prepare the pastry so the well part would not puff up. I covered it with an egg wash using a pastry brush and then filled the center with a little goat cheese crumbled and two or three tiny potatoes on top. Baked for 8 minutes and then sprinkled the crunchy caramelized shallots on top. The great thing about puff pastry, besides that it's easy and so good is that it's best to prepare ahead and refrigerate for at least an hour or longer. Puff pastry needs to be really cold when it goes into the oven, so I made them ahead, put them in the refrigerator and I popped them into the oven as I was getting ready. Do you love puff pastry too? all of this looks so delicious annie. and i love just about anything made with puff pastry b/c it's so yummy and vegan! First off - yes, yes I love puff pastry. My favorite recipe where I use it is this meat pie. Both of your variations on the dough/pastry look so good. You give so many wonderful tips and take such beautiful photos...it draws you right in. Did you every try cracking a couple of eggs on the dough after you add the potatos? So good! My mouth is watering just looking at these photos! Thanks for sharing your recipes. I love puff pastry too, and I have a packet in the freezer right now. I am definitely going to try this out as it loos so simple and delicious. Wow! This looks so yummy and pretty! Your puff pastry looks so delicious. I love puff pastry, they are the best! Thanks for sharing your recipe with us. Spectacular...I have all of those things right now in my kitchen and not a lot more. Your creativity is amazing, Annie. My mouth is watering! Even though I just got done hosting a friend over and we ate a ton, I could somehow squeeze in a few of the puff pastry bites! Tis' the season! Looks lovely and must taste great! Your little puff pastry tarts look, and we are certain are, delicious. What a splendid idea for a party - and something a little different. I can only really think of one word ... yum! Actually a few more ... my mouth is watering looking at those tartlets! 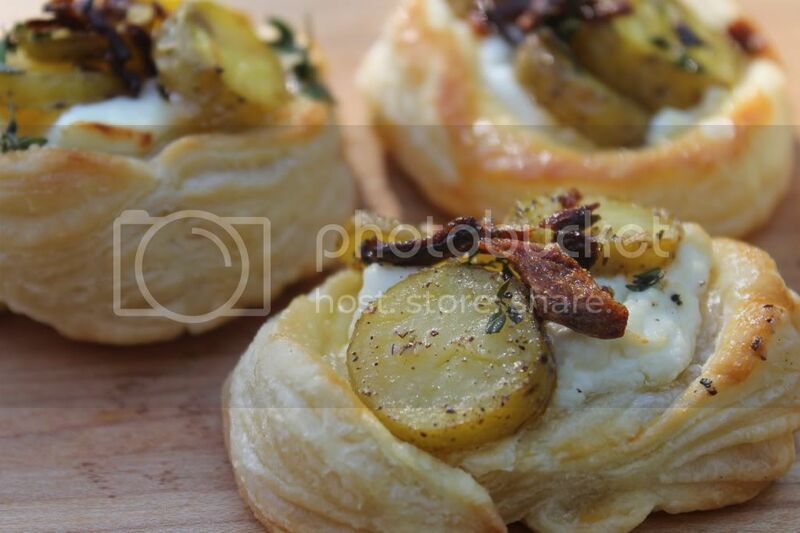 The little puff pastry appetizers look amazing...I'm running out of superlatives for your posts. The photos are mouthwatering. For some reason I avoid using puff pastry and I just have to get some and play with it. Those little fingerlings are so cute. Clever and Yummy looking! 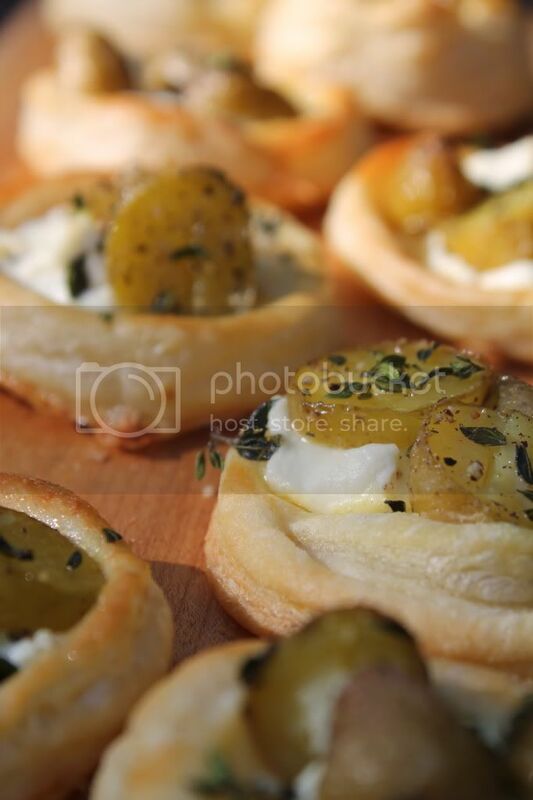 Your food photography is professional, it makes me want to make everything I see on your Blog. Looks so good Annie! Most of the time I have to follow a recipe. It's so great that you can just whip this stuff up! Yum these both look so good!! I wonder if 'Fngerling' potatoes are the same as 'Kipfler'? They're very similar looking..
By the way..., when the 'Lovely' cookbook coming out? I want to be on the waiting list..
Looks amazing! The tarts are adorable! Your photos are amazing. I reprinted this recipe not realizing it was from you.